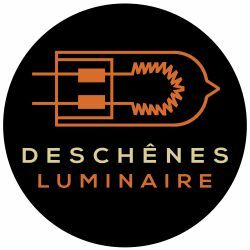 "Deschênes Luminaire is a lighting fixture manufacturing workshop based in Montreal since 2010." Offering a complete range of creative services. For a lamp, major architectural luminaire or even a light installation, everything is designed, manufactured and managed with the additional benefit of working with a single intermediary. Using a wide range of materials and finishes, we seek to optimize the factors of sustainable design, which include a timeless aesthetic and quality of manufacture.